Definitely, the popularity of WordPress today has grown tremendously compared to when it was first released in 2003 by Matt Mullenweg and Mike Little. Breaking into the CMS spotlight, WordPress has since known to the industry as the most common platform for anyone who wants to start their own website. With its almost unlimited number of plugins and functional yet visually stunning themes to choose, a lot of people will argue that WordPress indeed is a good place to start when you want to established your own online identity in the vast world of internet. That being said, a lot of people are still hesitant to make their very own WordPress website despite the fact that it is the most user-friendly CMS available in the market today. The reason for this is that they hold this belief that this CMS requires some intense coding skills or deep knowledge about stuff like web hosting and analytics. Though it’s somewhat true since there are some internal functions of WordPress that need some coding skills, and you need to choose a reliable hosting provider, this CMS has a very intuitive user interface that let even the most novice users to tweak it in every way possible. With its low learning curve, one can surely get the hang of it in the in just a couple of days. An easy to use interface which allows all users- from novice to experts- to manage their website easily and hassle-free. It’s a browser-based system so you can access your Website from any computer you want. It doesn’t require HTML editing, allowing you to create a new post in a breeze. Its structure can be easily understood by search engines. If you’re planning to take your business to the next level, then introducing it into the world wide web is the most sensible step you need to take. 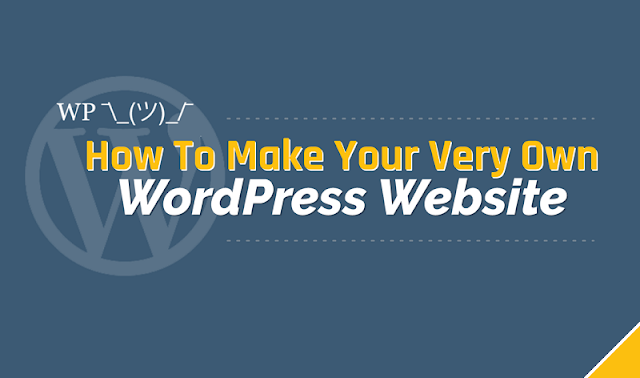 To do that here is an infographic from WP Shrug that covers all the basic steps on how you can build your own WordPress site today.